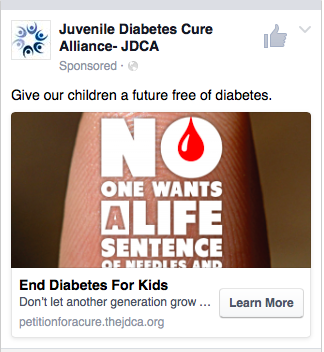 The Juvenile Diabetes Cure Alliance wanted to create and promote a petition designed to push the two largest diabetes charities in the world to increase cure research funding. There were two goals--one, try and attain 75,000 signatures over 5 months, and two, gain a meeting with both the heads of the JDRF and ADA. The petition was slated to launch in September and it was my job to lead all the marketing plans for this initiative. The image below is a snapshot of our old website. It was outdated, ugly, had clunky functionality, and had weak copy. Even worse, only one person in the office knew how to actually change sections due to the amount of coding required. We needed a much better home for our content if we were going to do this petition. Over 3 months, I ported all of our old content over to a new Squarespace website, redesigning functionality, pages, and copy so that not only did it look and function better, but staff members besides our old tech guy could easily edit it if need be. Here is our new website. The JDCA didn't want to use a petition hosting site like change.org, and instead wanted to "own" the petition site. In addition, they were aiming for a 60% landing conversion rate. We hired a web developer and started working towards a format that was simple without being amateurish, and contained enough text to sell our story without burdening a potential signee. 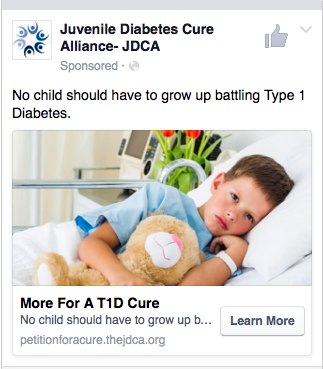 It also needed to give enough context that someone with little knowledge of Type 1 Diabetes may be convinced to sign. (more on how we accomplished this below). In the end, we arrived at design and content that I think strikes a balance between brevity and clarity. After a week of launch, the sign-up rate was 76%, beating the 60% goal, and we're fine-tuning ways to get above 80. Click on the image in the right to view the full petition. Type 1 Diabetes is a difficult disease for the public to grasp. Most people confuse it with type 2, which is generally the result of lifestyle habits and not an autoimmune disease. Because of this, there is a stigma associated with the disease that others don't have. Early on we realized in order to have a solid shot at our 75,000 signature goal, we would need people outside of the Type 1 community to sign the petition. We decided to create a video that would be embedded in the petition to explain our cause. Writing the script proved difficult, as it needed to be succinct enough to tell our story, while connecting with people who both had and didn't have the disease. After I had written draft that the JDCA was happy with, we hired a director to make it. In the end, we have a video that, based on the numbers of people who've watched and shared it (over 3,000 on one post alone), seems to be hitting the target. Next we needed to create a content plan that would carry the petition from it's launch in early September to the end of the year. We created both a calendar for Twitter and Facebook, as well as a program for Instagram to launch in October, and a few heavy marketing activities in November, which is Diabetes Awareness Month. I was in charge of Facebook posts and ads. I created multiple ad demographics (type 1, type 2, general parents, general grandparents, healthcare workers, and several others), and then designed around 7 ads for each group. Below are some examples--the first designed for Type 2 diabetes, the second for regular parents, and the third for a type 1 audience. We also created some shorter video content for social, as we knew our 45 second video would be too long for many audiences. I created the short simple "fun fact" videos to quickly surprise a person, with the hopes that they would click through and learn about our petition. Successful, but not in the way we anticipated. As we crossed 20,000 signatures, we gained a meeting with both the JDRF and ADA on separate occasions. We are now working with the JDRF, and seeing what can be done with the ADA, meanwhile, the petition has crossed 55,000 signatures.